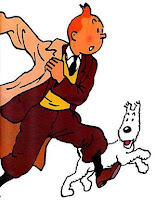 A SPECTACULAR new museum dedicated to Hergé, the pen name of Georges Remi, who created the comic-book hero Tintin, opens in the Belgian town of Louvain-la-Neuve on June 2nd. The museum, a fine addition to a somewhat drab skyline, is best seen at nightfall or under grey skies, says its architect, Christian de Portzamparc. In murky conditions, the building’s structure of angled white planes glows from within, offering glimpses through huge windows of an “imagined landscape” inside. The museum, newly built at a cost of €15m ($21m), runs around a central atrium formed of curving walls in bold colours, pierced by high metal walkways. An internal lift shaft at the core of the atrium is painted with a chequerboard pattern, evoking the moon rocket in one of Tintin’s bestselling adventures. The structure stands on stilts in a park and visitors enter across a long wooden footbridge. It feels like boarding a ship only provisionally moored at Louvain-la-Neuve, a symphony in red brick mediocrity. Within is a landscape of the imagination, brightly lit and coloured, as outside a steady drizzle falls against the windows from leaden skies. If that sounds like a memory of childhood reading indoors, it is no accident. 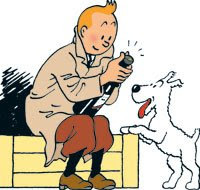 Since Tintin’s first appearance in a Belgian Catholic newspaper 80 years ago, generations have roamed the world vicariously through his comic-book adventures as a trouble-prone (if unusually clean-living) foreign reporter. Read the full story at The Economist online.